I’m not sure if Lou Reed would have liked this watch (I hope he would have), but I know I certainly do. 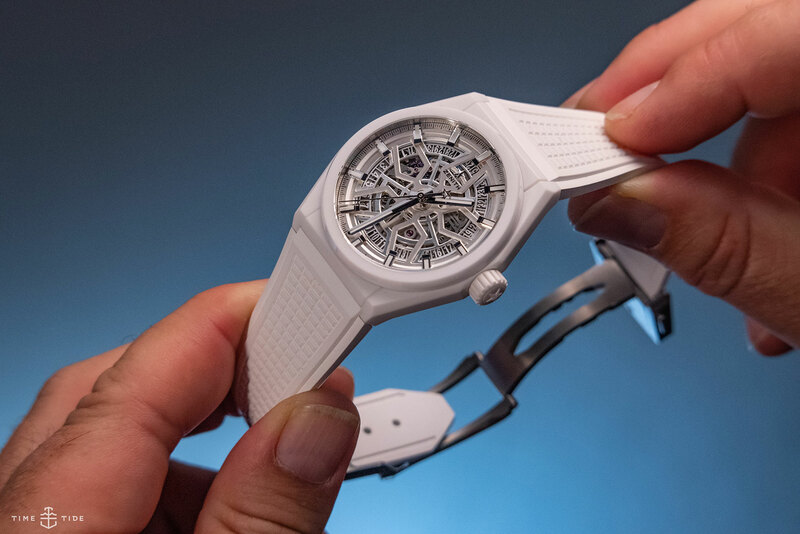 The modern sports line that is the Defy is an increasing priority for Zenith – a key, future-facing pillar for the brand that is both distinctive and incredibly versatile. This new version, all 41mm of blinding white ceramic, proves this point. Do me a favour, take a minute and check out another version of this self same design. Now, look at the watch below. It’s a marked difference. With the matt ceramic case, open-worked dial (replete with that signature star motif) and textured white rubber strap, there’s little argument that this is a watch intended to make a statement. Legibility, for example, is not the aim of the game. Having said that, in the few minutes I wore this piece (a few minutes more than I should have — I was a little smitten), I was quite taken at how wearable it was. Maybe not a daily suit-and-tie watch, but if you rock a more casual style, it’s certainly a viable regular rotation contender — especially if you were to swap the strap out for something a little more sedate, thereby toning down the overall package. This is not something I would say about all ceramic watches. In my time I’ve had the joy of strapping on a few Miami specials, and typically the finish runs to super glossy, which serves to amp up the effect of the case material. By going matt, Zenith have reframed white ceramic almost into the realm of design, as opposed to fashion. And I dig it.